Did Toyota Confirm That The FT-1 Concept Is The New Supra? We know a lot of things about the Toyota FT-1 Concept for sure. We know it was designed by the company's CALTY design studio. We know it would have 485 horses. We know it looks pretty swell. What we don't know for sure is if it is indeed the next Supra. But some people are claiming for sure that it is. Too often with concepts we've seen a wide gulf between what could be, what should be, and what is. The Toyota FT-1 most certainly could be and should be the next Toyota Supra. The Supra was an iconic car of the 80s and 90s, even though it was nominally produced from 1978-2002. Originally based off of the Celica, the Supra became a beast in its own right, famous for being able to take massive amounts of power with just a few modifications. Many people would like it to return. The stunning concept took this year's Detroit Auto Show by storm, and almost to the moment that it was unveiled, rumors started stirring that it would be the next-generation Supra. Now those rumors can come to a rest as it has been confirmed that the FT-1 will be produced as the next great sports car by the Japanese automaker. Now we've got nothing against Autoguide whatsoever, as they're surely a lovely bunch of chaps. But it looked a bit fishy to me. You would think if Toyota was going around announcing a new Supra, they'd have some sort of grand announcement, or hell, even a press release stating an official confirmation. And yes, the Chicago Auto Show and Philadelphia Auto Show, respectively, are going on now, but (and no offense to the wonderful denizens of those fine cities) they hardly seem like the place for Toyota to be making such a pronouncement. More like Tokyo, Geneva, or even Los Angeles. While Toyota heads were saying the car was merely a concept conceived to celebrate the Calty design studio's 40th anniversary as well as pay tribute to Polyphony Digital's 'Vision Gran Turismo' project, major publications were purporting the FT-1 to be the next-generation Supra. Now we have the definitive verdict: It is. But there is another sports car in the mix as well. 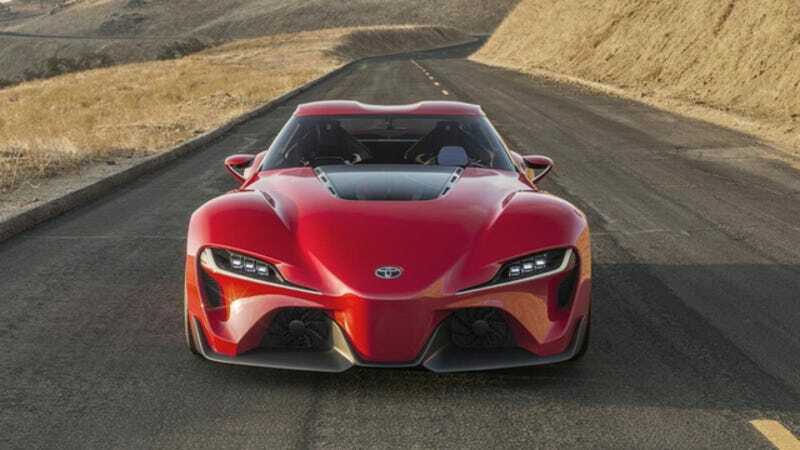 After a mandate from Toyota CEO Akio Toyoda calling for "cars that touch the heart", a source close to Toyota has confirmed the company is busy developing not only the FT-1 as the next Supra, but a smaller sports car too. Here, the information is only coming from one anonymous source, which hardly counts as an official confirmation. And just from my own personal experience in handling sensitive information, if you've got a really big scoop (as this would be), you're going to want to get it from at least two people. So did Toyota "confirm" the FT-1 to be the new Supra? I doubt it, as much as I'd like to be wrong. Oh, and there's some other bits about a smaller "sports car," but we can get into that at another time. We've reached out to Toyota, and we'll let you know if we hear back. UPDATE: Well, that was fast. Toyota got back to us, and while we're waiting to get some sort of official in-writing response, they're holding fast to the company line, at least here in the US. It is, as of this moment, a design study only, according to a company spokesperson.